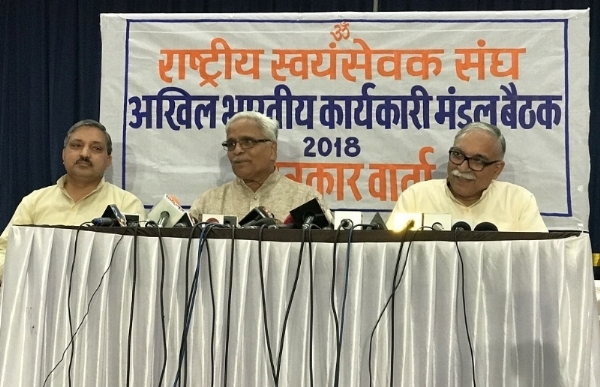 The Rashtriya Swayamsevak Sangh’s three-day Akhil Bharatiya Karyakari Mandal meet concluded today at the Keshav Srushti area near Mumbai. Sarkaryawah Suresh ‘Bhaiyaji’ Joshi addressed a press conference after the meeting and answered questions related to various issues. Sarkaryawah Suresh ‘Bhaiyaji’ Joshi said that the issue of Ram temple in Ayodhya is connected with the sentiments of crores of Hindus. The Supreme Court should realize this and expedite the proceedings of the matter. The Hindu society has been running a movement since last 30 years on the issue of Ram temple. The society expects that a grand Ram temple should be built and all hurdles associated with it should be removed. However, the wait has been inordinately delayed. The High Court had given its ruling in this matter in 2010. The matter is pending in the Supreme Court since 2011. The three-member Supreme Court bench, which was hearing the case, has delayed the hearing for a long period. When the court was asked when the hearing would take place, they said that they have other priorities. It is their right to decide when to hear a case, but the court’s reply has left the Hindu society feeling humiliated and pained. The Supreme Court should rethink on this matter. The society should respect the court and the court should also respect the society and its sentiments. It is for the government to decide when it wants to enact a law or promulgate an ordinance on the issue of Ram temple. The Narsimha Rao government had filed an affidavit saying that the government will help in constructing the Ram temple if evidences after excavation suggested that a temple existed at the location. Now, when it has been established in the court, on the basis of evidence provided by the archeological department, that a temple existed there, no one should have an objection to the construction of a temple there. We are not putting any pressure on the government in connection with the Ram temple. On the contrary, we are talking about finding a solution based on consensus. The honourable saints should be consulted and a solution should be found. Any government runs on a balance between consensus and law. The government did not construct the temple in spite of having majority – this shows its faith in the court. The court too should understand the sensitivities of the issue and think on it. Had the Sabarimala temple issue been limited to the entry of women, we would have supported it. There is no discrimination between men and women in Hindu society. In the Hindu system, no puja is completed without the participation of both husband and wife. However, some temples have their own rules. A society is run on the basis of not only rights but also traditions and beliefs. Women should get entry in all temples. However, it would not be appropriate to take any decision regarding specific traditions related to temples without consulting the temple’s management. The court should try to arrive at a consensus while giving its ruling in such matters. A review was conducted of the Sangh work at this meeting. We are growing since last six years. The work has grown by one and half times in past six years. Today, Sanghshakhas are functional in 35,500 villages. In comparison to last year, there is an increase of shakhas in 1400 villages. Sanghshakhas have risen to 55,825. There is an increase of 2200 shakhas since last one year. The weekly gatherings of Sangh are going on regularly in 17,000 villages. In 9,000 places monthly gatherings are going on. The actual Sangh work is going on in 61,000 places. The number of Sanghswayamsevaks has gone up by one lakh since last one year. Sangh has formed taluka, blocks and mandals depending upon the geographical conditions to expand the work. There are 56,600 such mandals. We have reached up to 32,000 of them. Sangh has been running 1.70 lakh social projects across the country. They are in rural, urban and tribal areas. Sangh has been running 25 big hospitals, 12 blood banks, and 50,000 single teacher schools in the tribal areas. The first aid services are being run in several villages through 10,000 ArogyaRakshaks to provide immediate medical help in general illness. Similarly, we are running 20,000 women self-help groups. Apart from that, hostels and coaching classes are also being run. Last year, 30,000 Sanghswayamsevaks planted 13 lakh saplings at 2,000 places. More and continuous work will be carried out in this field in near future. The Akhil Bharatiya Karyakari Mandal has taken the issue of environment protection and water conservation seriously. An extensive work will be carried out in this field in coming days.